Is There A Doctor In The House? – Run. Ride. Roam. No, the title of today’s post isn’t because one of us is ailing in any way, rather it is yet another reference to a TV location! 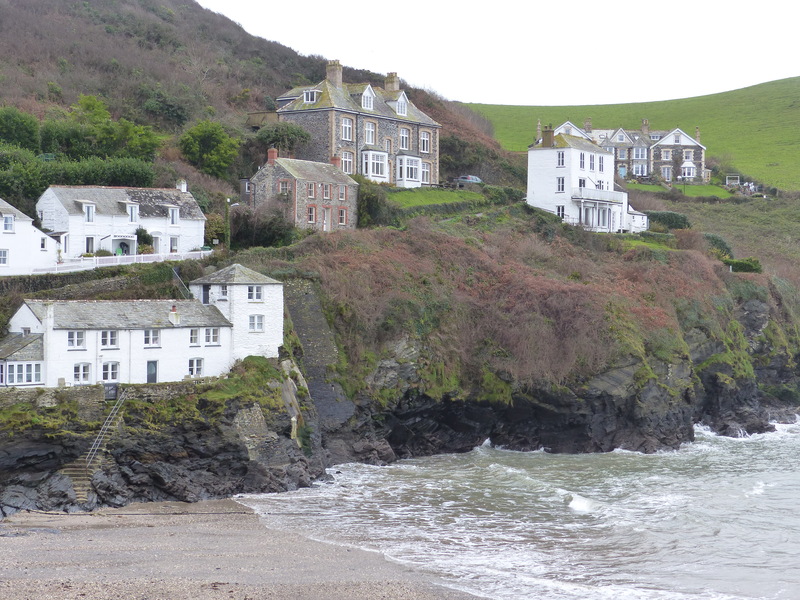 On another grey, rainy day and with that wind still howling fiercely, we set off across Cornwall to visit Port Isaac, the little fishing village where the TV series Doc Martin is filmed. We had intended to get back on the bikes again today, to do our exploring, but the gale force winds had not eased at all and are forecast to continue for the rest of the week. So, once again, the weather has been our nemesis and is wreaking havoc with our cycling plans. Again! 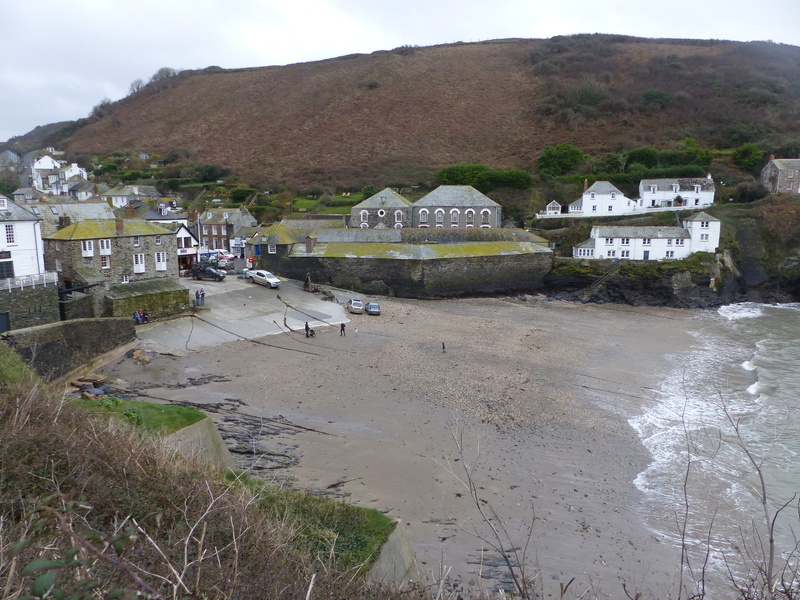 On the way to Port Isaac, Steve had an opportunity to exclaim, “Awesome!” The reason for his excitement?…a ford! (As in water, not car! I don’t think he finds Falcons, Fiestas or Focuses particularly awesome-worthy!). We were winding our way along the narrow country lanes again, around corners and up and down hills and as we came down and around another corner, we were faced with a small lake of water across the road. Time to ford the ford! Steve attempted to contain his excitement about driving the van through this large, vehicle sized puddle and then 1..2..3..in we go! 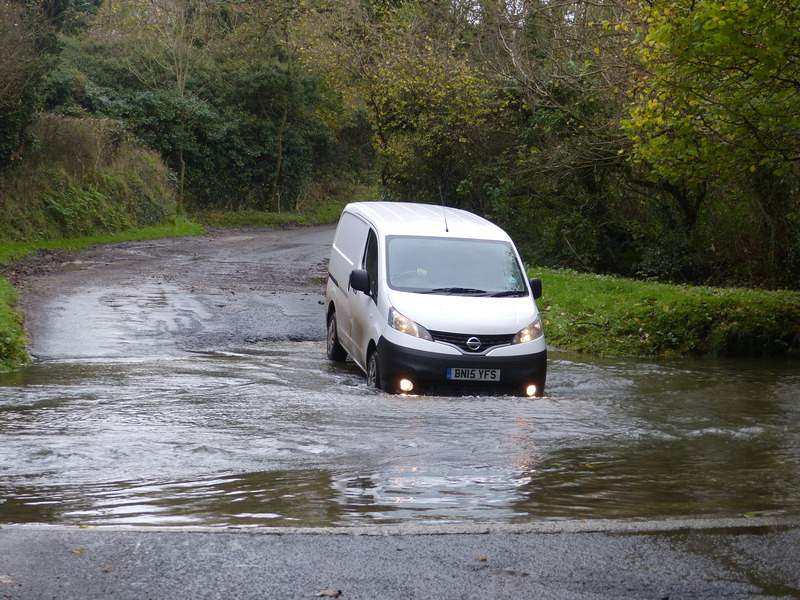 Thankfully the van got through, it didn’t sink, bog or stall and we were on our way again. 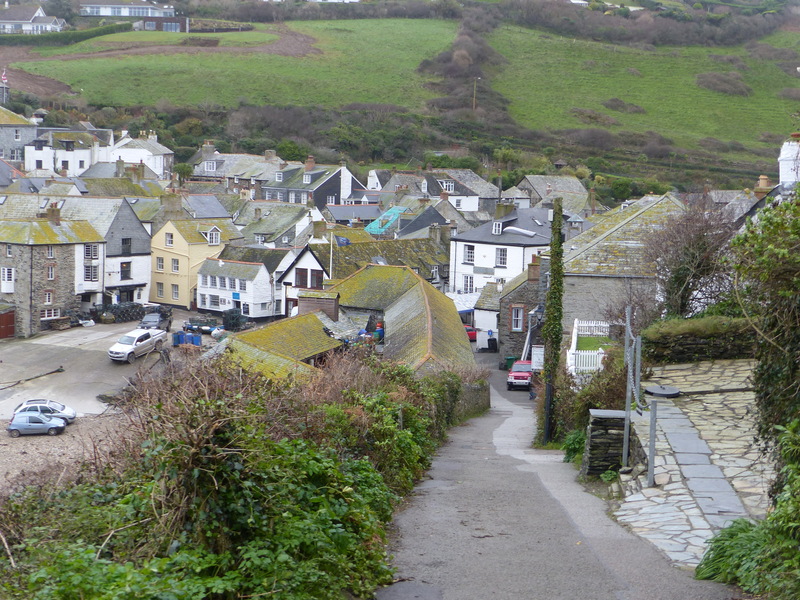 Port Isaac (a.k.a. Portwenn on TV) was a lovely little fishing village. 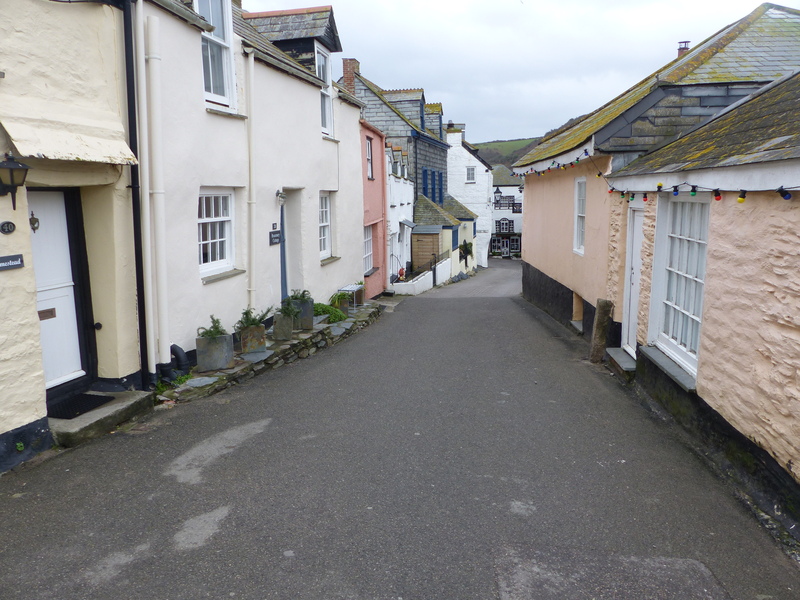 I’m not a regular viewer of Doc Martin, apart from the odd episode here and there, so I can’t say anything looked particularly familiar, but it was a quaint, pretty little place to visit, with cottages dotting the cliff tops. We parked the car on the hill top and walked down into the village and as we set off, I got a chuckle from yet another sign. 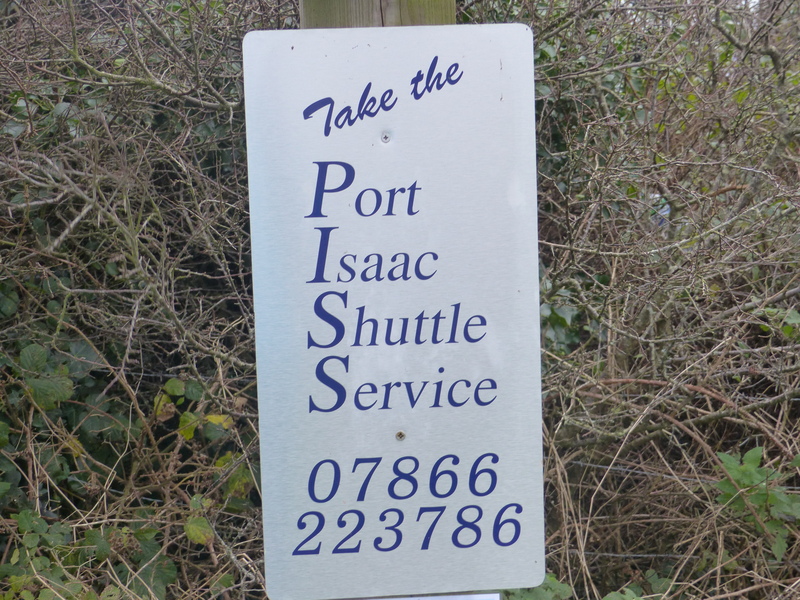 I think the people who designed this sign probably like to take the…! Walking through the village, each time we passed someone, they were very friendly and gave a smile and a “Good Morning”. I thought they might be a bit tired of tourists, because they must get heaps of them since the TV series started filming, but everyone was very nice, which just continued the trend of lovely, friendly people we meet here. After a blowing and blustery stroll around the village and up and down the hill, we set off again, through the countryside. 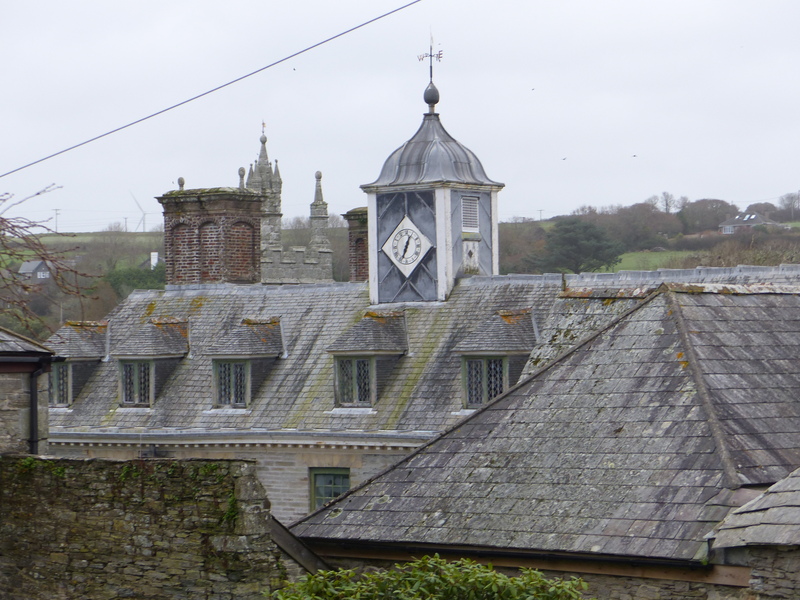 We drove through another lovely little village, St. Mawgan, which was tiny and seemed to only have a couple of churches, a couple of shops and a village store, although it did have a school, which was nice to see. I think little villages often fight to keep a school, when they are so small, but it was nice to see this tiny little place, with children outside the school screaming and laughing and playing. A few miles down the road was Newquay. Hmmm, it kind of broke the theme for the day. 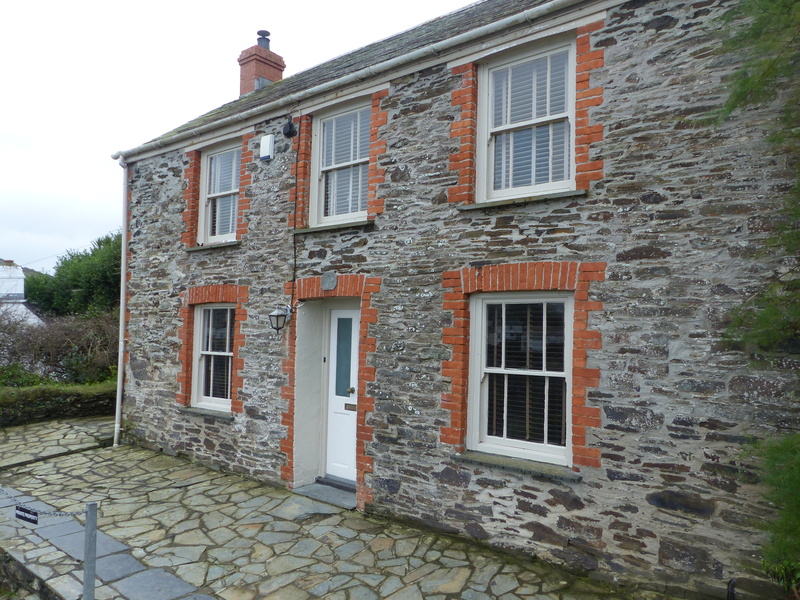 After seeing pretty Port Isaac and quaint St. Mawgan, Newquay wasn’t either of those things. It had a touch of Weston-super-Mare about it, with the high rise buildings, tattoo parlours and tourist shops. There was scaffolding all around town with more and more tall blocks of apartments being built and I can’t say it looked pretty or beautiful. 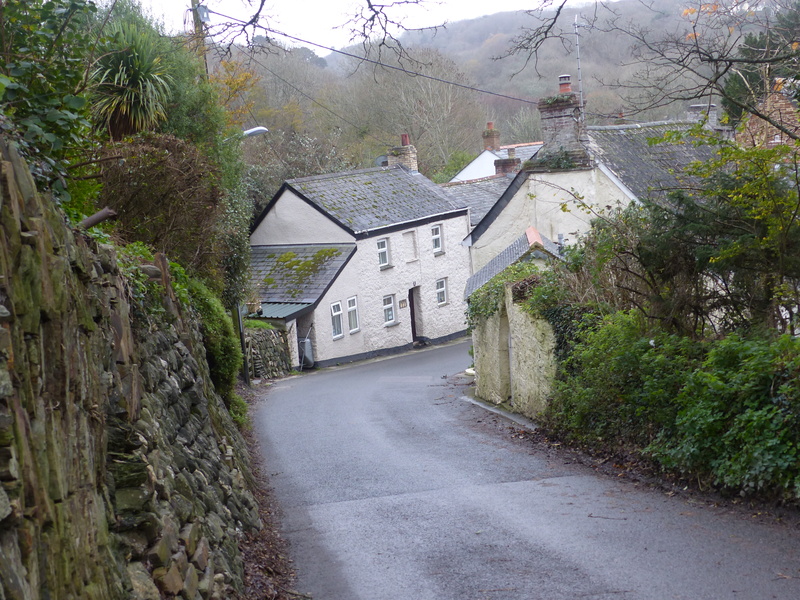 It was a big town though, so I guess it can’t be “pretty” and “quaint” everywhere in Cornwall! Time to head back. We made our way towards St. Austell and called into a supermarket for supplies. This is where I just stood in the aisle for a while, to listen to the gorgeous Cornish accents around me. 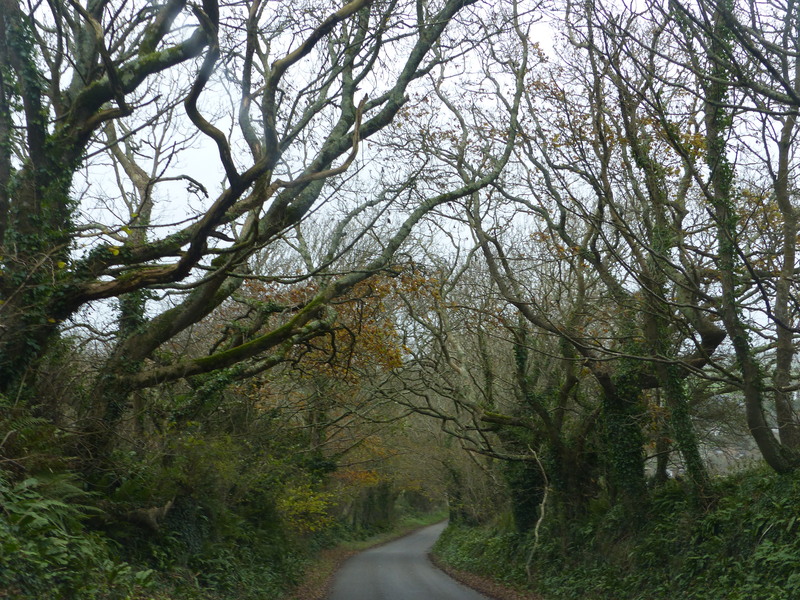 I’d been waiting to hear that quintessential Cornish dialect and we hadn’t really been in a situation to hear it much, so when I found myself with chatting shoppers around me, I just had to stand and immerse myself in it! When we got back to the room, I set off to do another run in the gym, to add to the one I did this morning and that was the day. We didn’t do a whole lot, but we did travel far and wide and visit some lovely little places, so that makes it another gem of a day. Tomorrow we move on and may find ourselves staying in another part of Cornwall or back in Devon or even in Somerset, we aren’t sure yet. We need a bit of a break from driving, since it’s been our mode of exploring lately (all because the #@*%! weather has kept us from the bikes!) as well as moving between destinations, so maybe we’ll just do a short stint in the van tomorrow. Freedom has always been one of the best things about this trip and whether on the bikes or in the van, we just go where the road takes us, stop when we feel like it and often don’t know exactly where we’ll end up. That’s the adventure! That’s the fun of the travel! It’s all a bit surprise! For this Tassie traveller, who likes certainty and plans and timetables, I’ve learnt to love surprises! Ditch the plan and embrace the unknown! It’s travel therapy! Cornish Coast And Country In A Little Bit Of Breeze! Hi Lara! I’m so glad you’ve caught up and are travelling with us again. We certainly are getting to see some beautiful and amazing places. I’m living with a “warm glow” from everything I’m seeing and Steve is enjoying his count-down, waiting for my “I love it” moments! Merry ol’ England sure is magic, so I’m glad that’s translating OK through the blogs and you’re enjoying the read. In a few weeks time, put the kettle on and we’ll settle in to tell you the stories in person! It was very pretty. I just love the little villages like that and it was nice that it still looked unspoiled, even with a celebrity status!